There are two very big malls in Cape Town which vie for supremacy – one is the V&A Waterfront, the other is Canal Walk in Century City. At PickACar like the one in Century City, besides the fact that one of our main partner dealers, Jeep Century City is based there, it's a great space to check out the latest cars. We caught up with everyday folk and asked them a few questions at the recent Canal Walk Motor Show which was in partnership with CAR magazine. An overwhelming majority of the shoppers at the stands, most of which already have cars agreed that Mercedes-Benz was the most impressive motor vehicle of the lot. We figured the people's reasoning was that Mercedes-Benz, a very popular brand name in South Africa, was the most practical of the bunch. We feel the same. The current Mercedes-Benz S63 was certainly the saloon that stood out. It's outstanding design both inside and out was a great leap forward for Mercedes-Benz, which for a while had lagged its rivals. The S Class, being at the top end of the automobile market not only has to compete with the usual BMWs and Audis, but the likes of exotic brands like Porsche or Aston Martin., both of which where represented at the auto show. South Africa's tastes in motor vehicles is slowly but surely changing, and for the better. Here's what we mean. Remember how many years ago, sub standard motor vehicles where offered as entry level cars. Where quantity trumped quality. Today, that's all changed, and even the cheapest of cars have shown promising quality. Take a look at the recent Chverolet Spark for example. Chevy was never really the best thing to come out of America, well at least in the eyes of South Africans, but the marquee has gone from strength to strength with the Spark, and its become very popular. Another great example is to look back at the days when Hyundai and Kia started gaining a following in SA. Pick a car from Kia back in the year 2000 and the quality has certainly improved since then. The stalwarts of great cars, for example, BMW, Ford and Volkswagen still lead the way in SA, but they're getting competition from Korean and even Chinese brands. Unfortunately, the Canal Walk Motor Show didn't have representatives from BMW and Ford, but there where some other cool cars at the show. Now, there are a lot of basic cars out there, and then there are these. On our car finding mission, we discovered the Mercedes-Benz CLA AMG, Lamborghini, a McLaren, and Aston Martins. 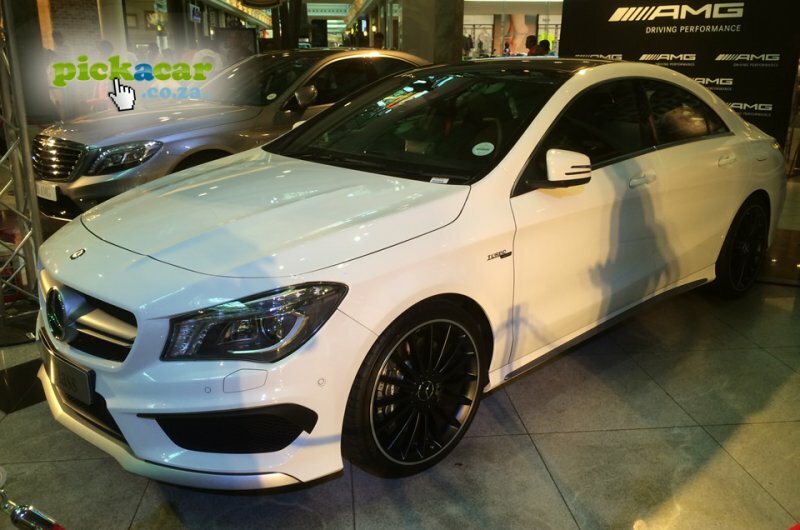 For this CLA, Merc has employed a powerful engine from its AMG Performance division. Simply put, you get 265 kilowatts of output from this car. The AMG version of the CLA is a permanent all-wheel drive, however, other models of the CLA also come in front wheel drive. Our experience with the inside of this car was great. It's complete with everything a buyer can expert for a motor vehicle of this stature. We all know that the CLA is the little brother of the S63, so it might be a great car in its own right, but the S63 is just on another level. With or without the Spyder moniker, the Gallardo is a masterpiece of engineering. And with Cape Town being up there with the world's most pretentious cities, the Lamborghini feels just at home on our streets. The V10 engine powers a 405 kW car, with the coupé offering car buyers (more like wealthy enthusiasts) a six-speed manual, while the Spyder only comes in automatic. These two super cars where a grace to look at – beautiful, powerful, and very suitable for South Africa's new breed of millionaires. We unfortunately didn't bump into James Bond, and we couldn't produce our own secret agent tag because we where just not awesome enough. The Aston Martin, a British favourite, is one of the few cars that are still worth mentioning that come out of the rainy United Kingdom. We have great hopes for the Aston Martin brand and its future partnership with Mercedes-Benz. The Aston Martin DB9 was designed with superb artistry – the sort of elegance that makes you feel good about owning this car. It's exotic leather is more than just for comfort, it looks and feels expensive because, well, it is! This DB9 is called the most luxurious in history. Its insides are packed with great goodies – that V12 engine performs like a peach, and in all produces 620 Nm of torque, and can race a cheetah, that is, the DB9 can race from 0 to 100 km/h in 4.6 seconds! Other cool facts about this car is its braking system, which sees advanced carbon ceramic brakes fitted on all the cars. This ultimately helps deliver a better driving experience. We where certainly excited about our next car find, the McLaren MP4 12C. It was a race car, fitted with everything F1 drivers would like, and a cool Gulf Oil paint job. The McLaren MP4 12C would turn heads on the road because its just that cool. Our final take out from the cars we found at the show is this – normal everyday vehicles, like the used cars on Pick A Car didn't get enough representation. Sure it's nice to see the latest of the highest end of the spectrum, but car shows are a great place for potential buyers to interact with the cars they're most likely to buy. The super cars where beyond amazing to look at, touch, and experience first hand.